Daniel Tiger is basically our family therapist. We watch Daniel Tiger’s Neighbourhood on Netflix at least four times a week and I can credit the show to me surviving the last few months of the ‘terrible twos’. I’m confident that Daniel is going to continue to be my rock for the upcoming ‘threes’. If you’re not familiar with Daniel Tiger & his family I’ll let wikipedia bring you up to speed before I dive in. 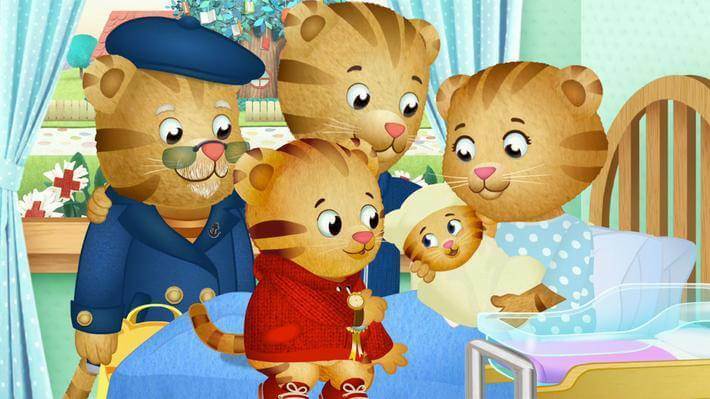 “Daniel Tiger’s Neighborhood is an American-Canadian animated children’s television series. The program, which is targeted at preschool-aged children, is based on the Neighborhood of Make-Believe from Mister Rogers’ Neighborhood, the long-running family-oriented television series created and hosted by Fred Rogers. Here are three lessons that Daniel Tiger & Co have taught me over the past few months. “When you’re feeling mad and you want to ROOOAAAR, take a deep breath and count to 4. 1,2,3,4!” Maybe you won’t relate to this but I am not someone who does well when things re going wrong, running late or generally not working out how I planned. I find parenting really really frustrating a lot of the time – mainly because Luisa is as strong willed as I am, we just have different priorities. We both take the DT approach of deep breathing and counting to four multiple times a day and it does help. I’m not proud of being a stressy mum but I am glad that I can acknowledge it and use little strategies to help us both chill out and stay on track for a good day. “When something seems bad, turn it around. Find something good.” This one ties in with the deep breathing, it’s so easy to get worked up with a toddler who seems to be defying you at every possible turn. Or to feel down and annoyed when other relationships are trying or work is tough. I love that Daniel Tiger reminds us to look for the good in every situation. Sure maybe we didn’t get everything on the to do list handled this weekend but we had a lot of great moments and it’s important to hold on to that. “Find your own way to say I love you.” There’s so many ways to show someone you care, for your partner it might be the little things like watching their favourite show or making a special meal. For Luisa it’s t.i.m.e over stuff, every time. Sure she wants ‘things’ but she really really values the time we spend with her, sitting on the floor playing the same games over and over – it’s what makes her happy. It’s important. So there you have it, if Netflix cancel Daniel Tiger I am going to have a breakdown but for now we are all good. It might sound a bit melodramatic but this cartoon has honestly changed our family and how we communicate with Luisa. She is so much more open to hearing my ideas or opinion when I can throw in a Daniel Tiger reference – if you’ve got a toddler give it a try!